Back in May, I wrote a two-part post entitled "One Book To Rule Them All" (part 1, part 2). The content focused on keeping a handwritten journal for ideas, notes, and planning. Not too long ago I came across two different articles on individuals who wrote out all or parts of the Bible by hand. 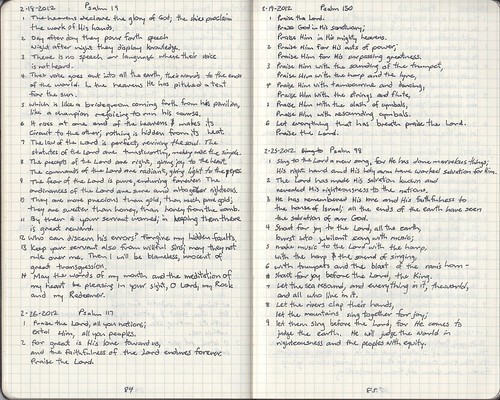 David Kulakov, an English teacher in Moscow, Russia, was impressed to write out the entire Bible. He started in 1997. Over a period of 2.5 years David spent 800 hours writing out both the Old and New Testaments on white copy paper. When the book was complete, David had it bound as a book. The Link to David's story. While searching for David's story, I found a blog post by Nathan Clark on the Northland Church blog. Nathan and his wife started with Genesis and wrote out several chapters. After a pause because of the life-changing birth of their child, they started again with Psalms. When I first read the story about David Kulakov earlier this year, I decided to give handwriting of some Bible passages a try. Because I wanted to actually complete the project, I knew I needed a managable portion of the Bible. I decided to write out 30 Psalms, writing out one per day. My first step was to identify a list of my favorite Psalms and write this list in my planner. I allocated one page per Psalm to ensure I had enough room while still being able to use my planner for other purposes. Using my planner allowed this project to remain visible on my task list. It was also convenient because I could add verses at any time. You can view all of the images in the 30 Psalms Flickr set. I am happy to report that I completed this project! As you can see from the infographic below, my 30 days were distributed over a period of 50 days. Being able to see my project status in real time inspired my to finished. I was consistent at first with daily journaling. The number of days between journal entries gradually expanded. Writing out these Psalms was a great experience. I gained a new appreciation because of the extra time spent on each verse. Writing by hand is slower than reading or typing and facilitates a different level of understanding and comprehension. I encourage you to select some passages or chapters that you find inspirational or comforting and write these out by hand. You will have a better appreciation of the Bible's writers and inspiration from this daily devotional. Let me know how your Bible project turns out!